2009 Sea Ray 580 SEDAN BRIDGE. One of Sea Ray's best layouts and design. Only 2009 on the market now and she is ready to go this summer. Located in Daytona area. Owners had her interior remodeled with new upgraded Carpeting throughout,, new bedding and LED lighting in the staterooms. She includes Hardtop with AC/Heat, Hydraulic swim platform, HD7 SAT TV system with 3 receivers, UPGRADED Garmin electronics w/ Sat weather and 3 cameras too. Has yacht controller remote control and Bow and Stern thruster for easy docking. She runs awesome with MAN CRM 900 engines with approx. 558 hours as of 16 July 2018. Just had bottom paint service and new prop speed done. 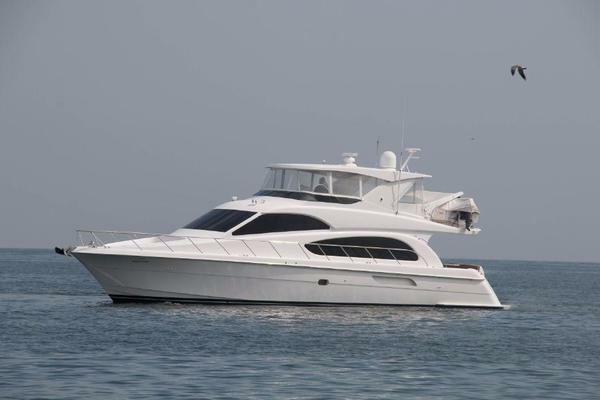 She is truly full turn key yacht ready to go the Bahamas or Florida Keys this season to enjoy quality time on the water with friends and family. Call for more details and set up private showing now!!! Twin thigh-rise helm chairs with up/down feature. Sirius® Satellite Receiver with antenna. Standard Raymarine Radar/chartplotter combo primary navigation unit and Sea Ray® Navigator™ III chartplotter as secondary display. Full beam master stateroom with 32" LCD flatscreen TV with head and shower en suite. Innerspring mattresses in master and forward stateroom. Standard sofa with pullout bed. Fully equipped galley with refrigerator and freezer with built-in icemaker, microwave, and coffeemaker. Standard tile flooring in guest head. Two full heads with separate showers. Fiberglass hardtop with 20 x 20 hatch and electronics box. High water bilge pump and alert system at helm. Potable water manifold system with individual system shutoff valves.